From a rose baby that loves the thumb to a cabbage baby that doesn’t miss a thing. 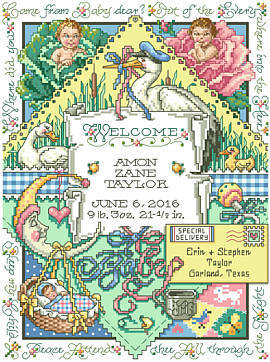 This baby Keep Thy child Birth Announcement Sampler makes a beautiful gift for a special baby. The lovely verse reads: "Keep my child, Peace attend thee all through the night, Where did you come from baby dear? Out of the every where into here." Decorate the nursery with this motif filled Counted Cross-Stitch design. Contents: Stitch Count 136w X 168h, Finished Size on 14-ct, 9" X 12"